I have spent my adult life working and volunteering in my passion: helping youth succeed in their life situation. I am honored to have the opportunity to continue to serve my passion as the President of the Nebraska CASA Board of Directors. The power of a caring adult in the life of a young person is pivotal. For children that are abused and neglected, the presence of a caring adult providing a voice is not just pivotal but invaluable! CASA volunteers truly are heroes and have the ability to have a very lasting impact. The Nebraska CASA Association is committed to supporting local programs to ensure that EVERY abused and neglected child across our state has an advocate. Please join me in supporting the children and youth of Nebraska by learning more about CASA and how you too can be the voice. 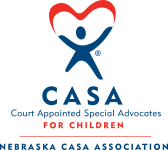 Our staff is dedicated to supporting local Court Appointed Special Advocate (CASA) programs. Our board represents a cross-section of our community and has a passion for providing ethical, quality programming for children. We strive to ensure long-term sustainability of the organization and oversee that the funds raised directly affect those in need.